There are few things more iconic during summer than a picnic. There’s just something fresh and fun about sharing a meal in the park or at the beach with family and friends. But just because you’re enjoying the warm, gentle breeze doesn’t mean you should throw caution to the wind. By following a few simple food safety tips, you can ensure that your perfectly planned picnic doesn’t make you sick. Planning it out. Not all foods are picnic-appropriate. Anything that requires a lot of perishable ingredients and/or a lot of preparation should be avoided. Stick with foods that require little or no cooking and that contain just a few ingredients. Foods such as fruits and vegetables (especially whole ones), hard cheeses, peanut butter and jelly, cereal, bread, and crackers are ideal picnic items. Anything made with commercially processed custard or mayonnaise will stay safe as long as they are kept cold. Packing it up. Use a cooler, if possible, and store cold foods together so they can help each other stay colder longer. Use ice or frozen gel packs to help keep foods cold. Pack foods directly from the refrigerator into the cooler; don’t leave them sitting out before packing. Store ready-to-eat foods separately from raw meats. If packing up hot foods, be sure to keep them in a thermos or other insulated dish. DO NOT store them in the same container as the cold foods. Paper towels, disposable utensils, and a food thermometer are ideal picnic accessories. Remember, keep cold foods below 41 degrees F and hot foods above 135 degrees F. Do your best to keep the cooler away from direct sunlight by storing it in the shade and be sure to replenish the ice and/or frozen gel packs when they melt. Consider packing drinks in a separate cooler, as they are consumed more frequently; this will reduce the exposure of food items to warm air until you’re ready to eat. Preparing the feast. All food items should be kept at the proper temperature at all times. When cooking raw meats, use separate plates for the raw and cooked products and clean and sanitize utensils between uses. Cook meat to the proper recommended internal temperature to ensure doneness and safety. Click here for a list of recommended internal cooking temperatures. Presenting the bounty. Discard any perishable foods that have been left out for longer than two hours. In really hot weather (generally above 90 degrees F), foods should not be left out longer than one hour. Keep food protected in storage containers such as coolers and lidded dishes to minimize contamination from flies and other pests. Serve small portions of food at a time and keep the rest in the cooler. Picnics are an important part of summer and with just a little bit of planning and a few useful tips and tools, they can be safe and delicious for everyone! Source: Beaugh, Kristina. 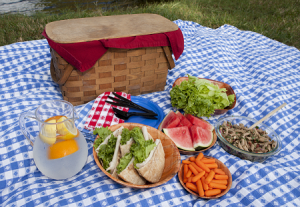 “Checklist for the Perfect Summer Picnic,” Foodsafety.gov blog, June 16, 2015. URL: https://www.foodsafety.gov/blog/2015/06/picnic.html.